FORMAT-4 wide belt sanders are renowned for their solid construction, high quality system components and excellent results. The premium model series “finish” will now be expanded to include two additional wide belt sanders: “finish 1350 classic” and “finish 1350 classic gloss”. 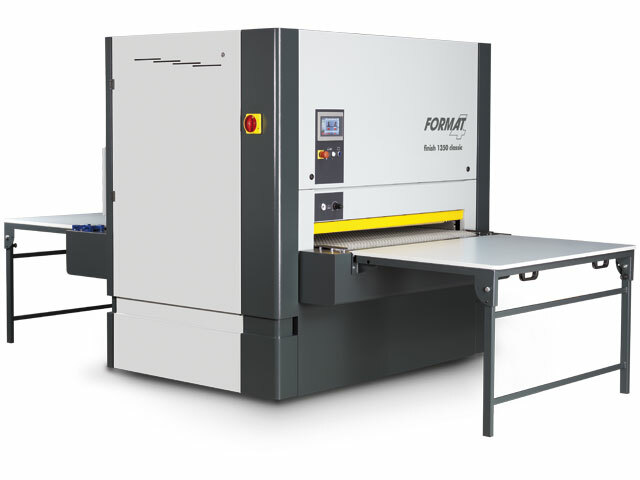 The new machines convince with maximum processing dimensions combined with the brand new super finish unit with chevron belt and electro-pneumatic segmented sanding pad as well as touch screen control. Five different sanding units and numerous individual optional extras allow optimum machine configuration for any challenge a modern workshop could face. Contact roller unit with rubber contact roller (85 shore) for calibration work. 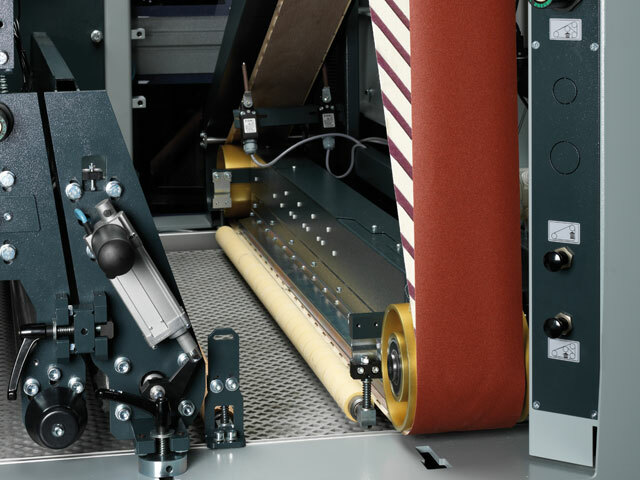 The combination module with segmented, electro-pneumatic sanding pad is particularly useful when working with veneered surfaces of varying depths or shapes. Individual segments can be deactivated and reactivated. You can hereby ensure that the machine only sands the scanned width of the workpiece. Additional to the contact roller, the combination super finish aggregate also has a sanding cushion with a felt glide coating (chevron belt). 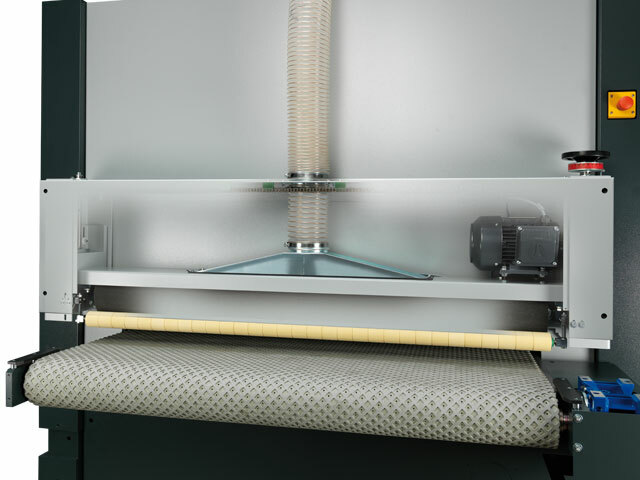 This glide belt applies an even softer sanding pressure on the workpiece and is used predominantly for the sanding of lacquered workpieces and for high-gloss materials. The completely uniform pressure levels out all oscillation marks and guarantees a homogenous sanding result. A segmented electro-pneumatic sanding shoe is included as part of the super finish aggregate as standard. Excellent sanding results even when processing round or angled are therefore guaranteed. 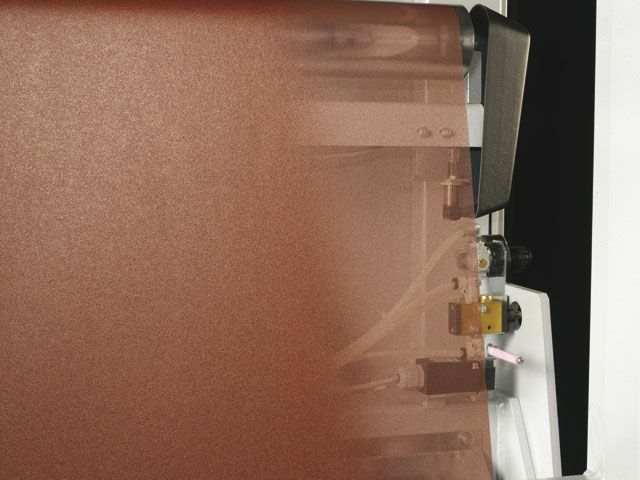 The cross belt sanding unit equipped with an electro-pneumatic sanding shoe and chevron belt as standard is particularly suited for the processing of lacquered surfaces and high gloss production. Rough wood fibres that cross the grain are removed by the sanding belt and the subsequent wide belt then smoothes the surface. The cross sanding direction ensures that there are considerably less wood fibres and a noticeably smoother end result is achieved. 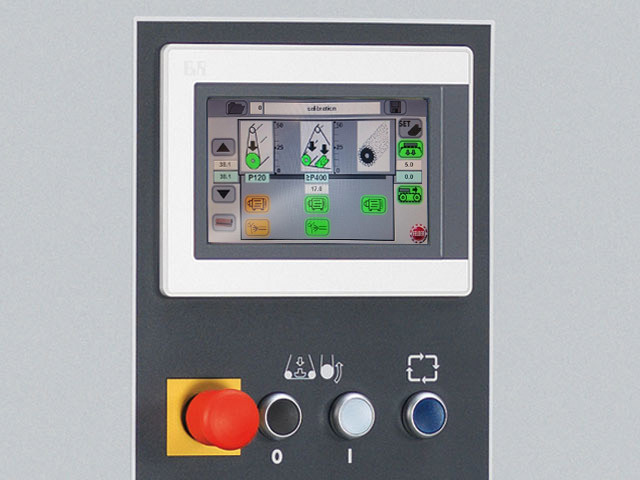 The clearly structured and intuitively laid out control panel offers the greatest ease of use and maximum productivity. 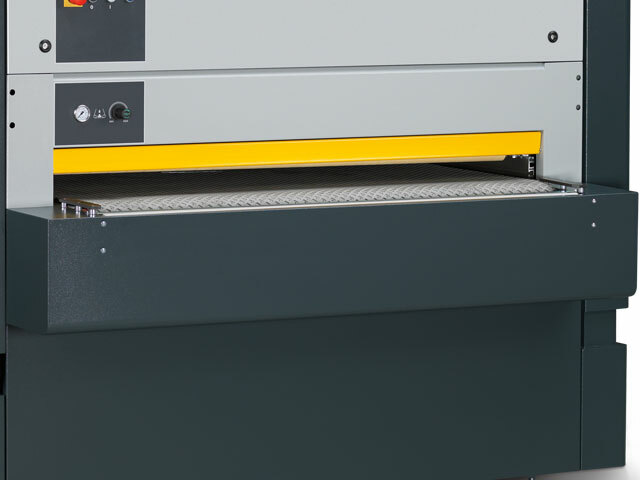 The machine functions are displayed graphically and controlled by high-quality switches. The infeed thickness is displayed as an overview on the digital display and can be adjusted in increments of 0.1 mm using the push button. The table extensions improve the angle at which workpieces are fed into the machine and also make it easier to work. As an option, on the delivery side of the machine, it is possible to set up a brushing facility. Different brushes can be inserted and their task is to clean, polish or structure the workpiece surface. 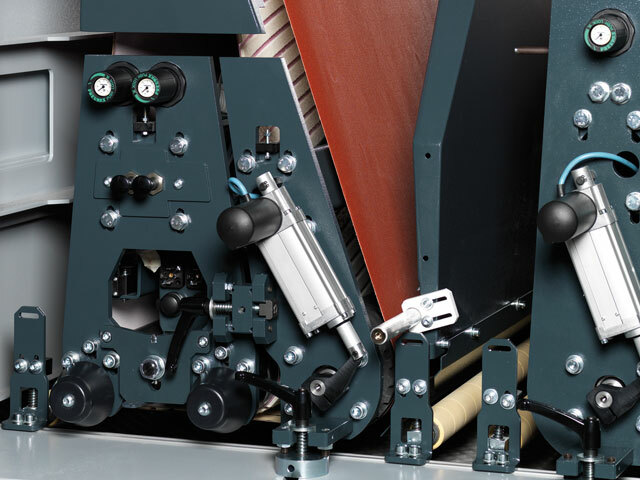 The belt guidance system scans the workpiece using a modular spotlight and activates the electro-pneumatic belt guidance system, which moves the belt fowards and backwards. 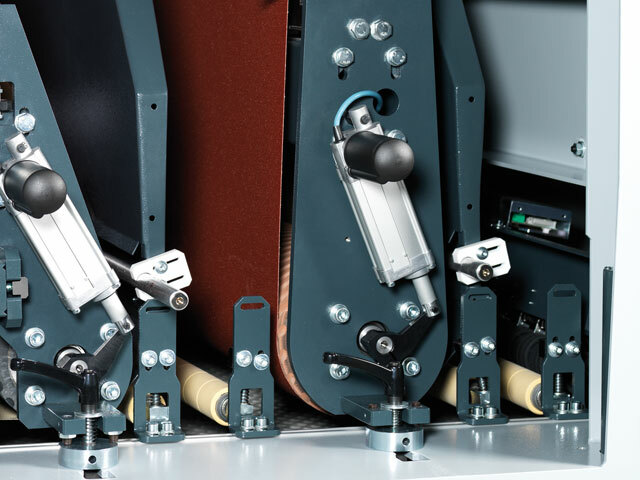 The belt control system regulates the belt movement with electronically guided photo cells. Should the belt be at risk of coming loose, the belt control system stops the belt motor immediately.